It is quite a long time that I do not read and post an inscription. Well, not that long: let’s say one month or so… but I missed it. Today I woke up and said: ‘Today I have to read a gravestone’: and here we are. Alabaster gravestones from 10th century Nishapur are not that common: as long as I know there are three of them. The first one (Metropolitan Museum, acc. num. 36.20.27) and the second one (Metropolitan Museum, acc. num. 34.152) are already read… with this one I admit I had some issues. Maybe because only the lower part survived, or maybe because the kufic script is extensively embellished, but for me was not that simple, and my translation is still missing some words. The kufic script, as already said, is deeply decorated. Calligraphy and decoration are everywhere: in the fourth row a small flower is inserted in order to avoid to have a blank space after the wa’. In some letters the decoration is so overwhelming that they do not seem to be letters any more, and this is the case of the ‘ayn and lam, for instance. Sorrowfully we can just wonder how the upper part looked like. Most probably it comprised a small arched, filled with the first lines of the inscription. What was around the arch is not easily determined: probably parts of the inscription and decoration. 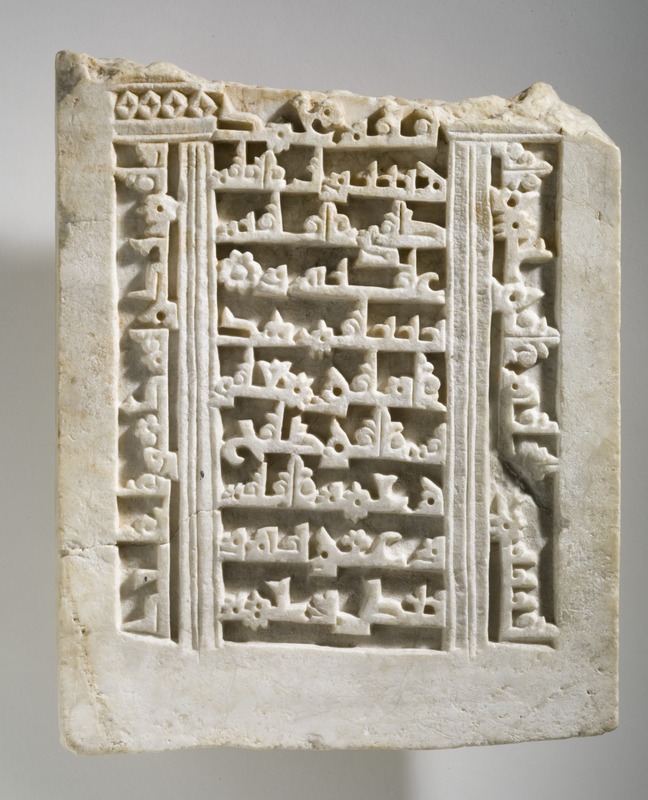 This can be presumed comparing the slab with the two other alabaster gravestones from Nishapur, dating back to the 10th century. Also in that cases the gravestone comprised an architectural niche, a two-dimensional mihrab that enclosed the inscribed text. As the inscriptions of the other two gravestones were much less decorated, it is possible to determine that the one we are reading now is more recent. 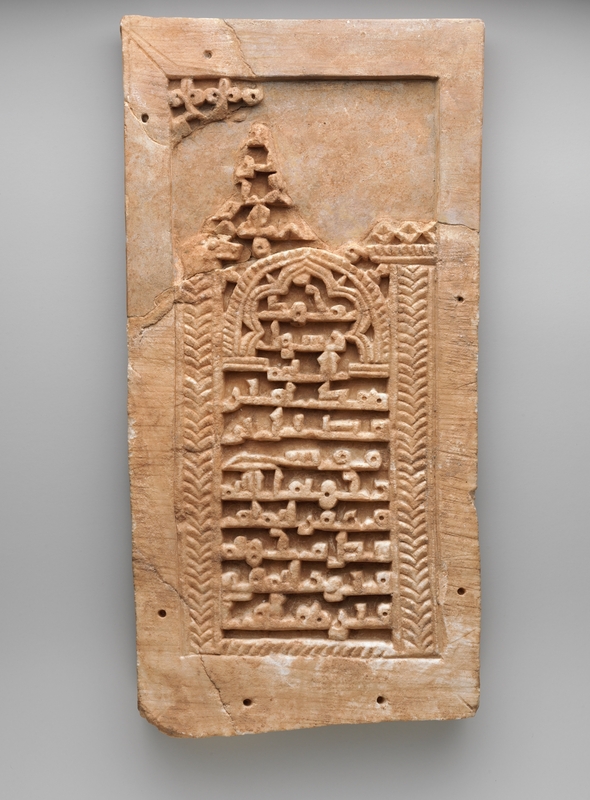 Another interesting feature in the text arrangement of this gravestone is the fact that the text does not run only horizontally, but also vertically on the two sides of the mihrab, forming something like a frame. This feature will have been further developed in Iranian tombstones, in particular in those dating back to 12th century Iran. Reading the inscription, is it even clearer how this tombstone refers to the same tradition of the first two, yet with some difference. may God be merciful to him / grant him pardon and / whiten his face. On the right hand, vertically, we read the starting of the basmala, reading: ‘In the name of God the merciful […]’ and probably continuing in the upper part, now lost. On the left hand side, vertically, there is a part of inscription, extensively decorated in the first part but with the last word quite plain. It comprises the last verse of the Surat al-Ikhlas (Q 112): ‘Nor is there to Him any equivalent’. The two vertical texts can be probably seen as part of the same frame, running around the internal architectural niche and text and displaying the entire Surat al-Ikhlas. This is a feature most common in Iranian tombstones of the later period, namely the 12th century. In more than one Q 112 appears in one frame around the funerary text. 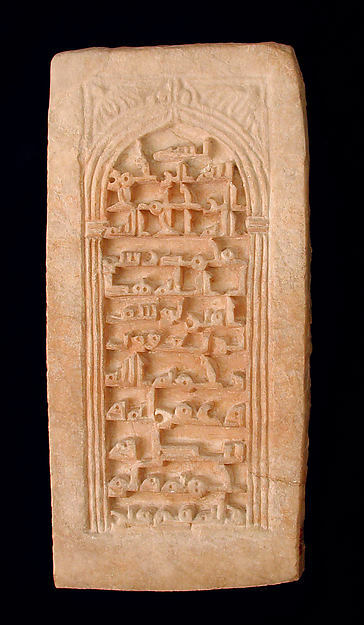 Well, it is not exactly the missing link, but this gravestone can be seen as witness of a change in the tradition of gravestones and funerary inscriptions: a change that eventually brought to the replacement of pious phrases by Qur’anic quotations in Iranian tombstones. The next step is analysing gravestones from 11th century Iran, and see how this change took place.